Googling eLearning: Corporate eLearning Strategies and Development hits at page 14. UPDATE: Good news! 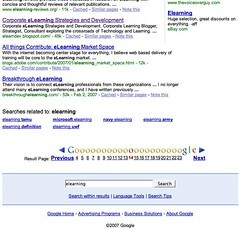 A google search on elearning development puts elearndev.blogspot.com on the first page...item 3 no less.